While growing up in Canada, Dr. Daniel Clements became very involved in the hockey program and achieved a hockey scholarship to Minnesota. Throughout his career in ice hockey he was exposed to chiropractic care keeping him healthy and free of injuries, allowing him to compete and perform at a high level. Furthermore, as Dr. Daniel was getting his degree in Pre-Med, he recognized the path that healthcare was heading towards, with ongoing prescriptions and only treating the symptoms rather than the cause of disease. This allowed him to move his professional career towards an area that would really help people. 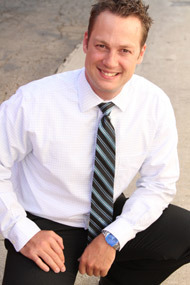 Dr. Daniel received his Bachelor of Arts with a Major in Chemistry at Augsburg College Minnesota. He received his Doctorate of Chiropractic Degree from Southern California University of Health Sciences. He was honored for being on the Dean’s List when completing both degrees, and shared the award for best chiropractic technique with his twin brother amongst his graduating peers. Dr. Daniel looks forward to meeting you. Call the office today to schedule an appointment.